When Sir Charles Baskerville is found dead on the moors, a heart attack seems to be the likely cause. However, a certain Dr Mortimer thinks there is more to it than that. Although it seems impossible, he believes that a supernatural hound is haunting the area. His theory suggests that this beast has been on the rampage for years, killing generations of male Baskervilles With the victim's son returning home from Canada, and the mystery still unsolved, Dr Mortimer turns to Sherlock Holmes for help. 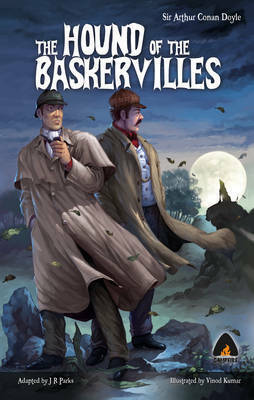 He is worried that the deaths will continue until all the Baskerville men are wiped out - or someone discovers the truth. The unparalleled detective, Sherlock Holmes; his sidekick, Dr Watson; and an intriguing and mysterious plot make Sir Arthur Conan Doyle's The Hound of the Baskervilles a compelling read. Arthur Conan Doyle (1859-1930) was a British physician and writer, most noted for his stories about the detective Sherlock Holmes, which are generally considered a major innovation in the field of crime fiction. He was a prolific writer whose other works include science fiction stories, historical novels, plays and romances, poetry and non-fiction work. Having received professional training from the N S Dhammi Art Group, Vinod is a highly experienced artist who has created more than 400 comics for the Indian comics industry.